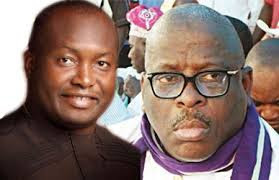 The National Caretaker Committee of the Peoples Democratic Party has suspended Ifeanyi Ubah and queried Senator Buruji Kashamu for alleged anti-party activities. While Kashamu, who represents Ogun East in the Senate, was queried for his activities in the South-West zone of the party, Ubah was questioned for allegedly disparaging national officers of the party and those that conducted the Anambra State governorship primary. While Kashamu has replied to the query and denied issues raised in it; Ubah has, according to the party, ignored the party’s query. Spokesperson for the party, Prince Dayo Adeyeye, stated this at a press briefing in Abuja on Thursday.